Join Lana, Munch, and Griffin on the adventure of a lifetime as they travel through the Holy Land and learn about the stories, cultures, people, and places of the Bible. High-quality illustrations, engaging sidebars, and scripture passages draw kids into the narrative. The Story Travelers Bible teaches kids that the Bible is more than just a bunch of tales told by parents and Sunday school teachers, but the Bible documents God’s work in and for His people from the beginning of time. 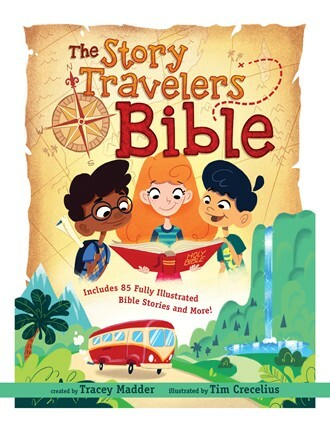 The Story Travelers Bible will take kids on a ride through 85 Bible stories.